Bloom Day on Father’s Day? Really? I figured this out about 7 o’clock last night, but by then I was too sun-blasted to muster a post. Marty wanted his day spent at a local Irish fair. Guinness and “trad” music for him, Irish wolfhounds and sheep herding displays for me. 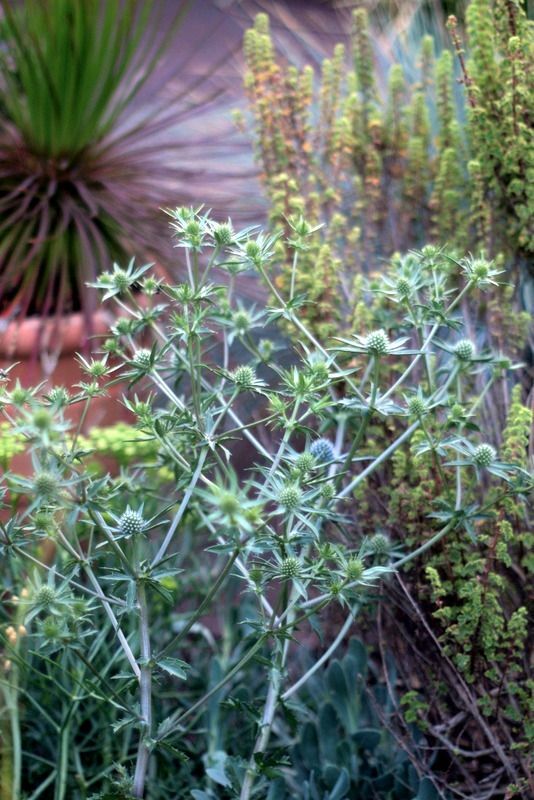 Running late, on to my experiments with herbaceous stuff for a dryish zone 10 Southern California garden. A counter-intuitive direction in the land of palms, agapanthus, and bougainvillea but for now my idea of summer. June brought the agastaches. 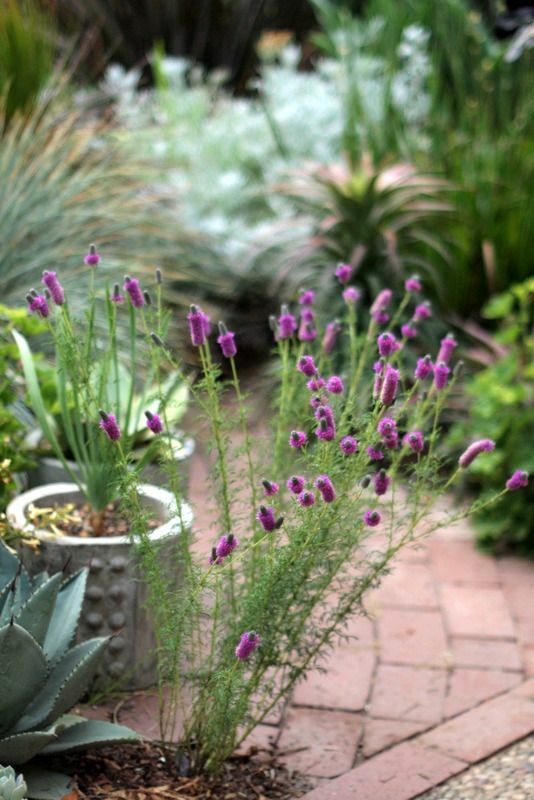 Dark blue in the background is Lavandula multifida. No complaint from me. A corner of blue isn’t a bad thing on a warm day. The lavender and catmint ‘Walker’s Low’ is here too. 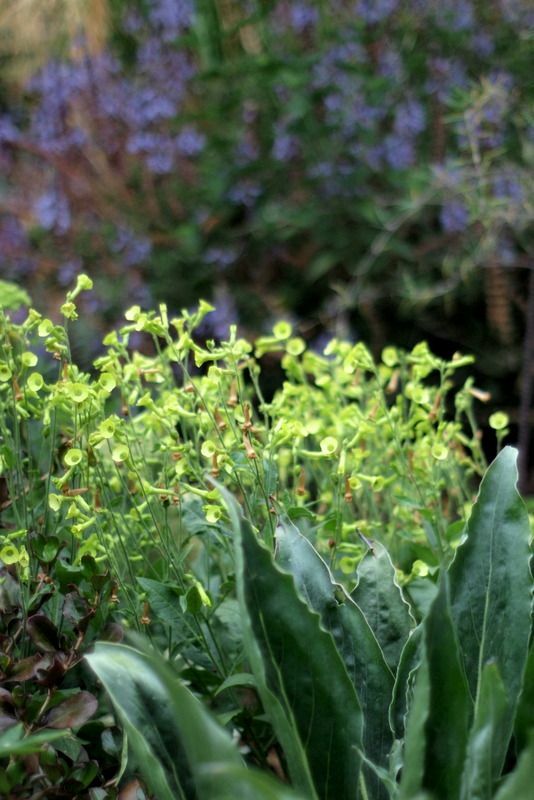 Self-sown nicotiana with the plectranthus, leaves of Echium simplex in the foreground. 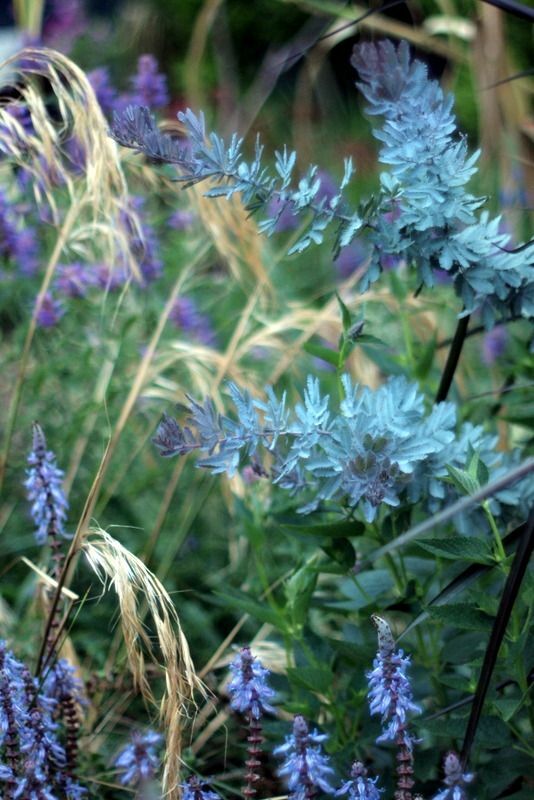 Agastache ‘Blue Fortune’ is a pale, milky blue. 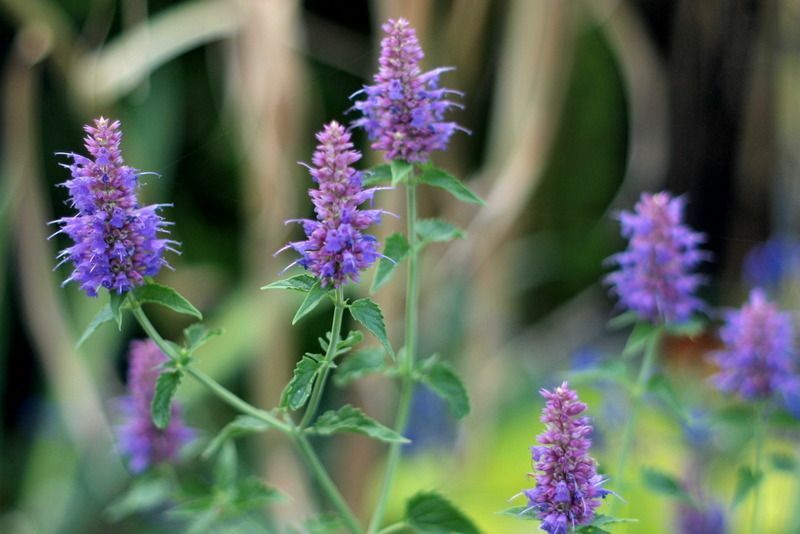 Maybe a little insipid compared to some of the darker blues like Agastache ‘Purple Haze,’ which I neglected to photograph. But BF has an admirable chunky structure and wonderful leaves. 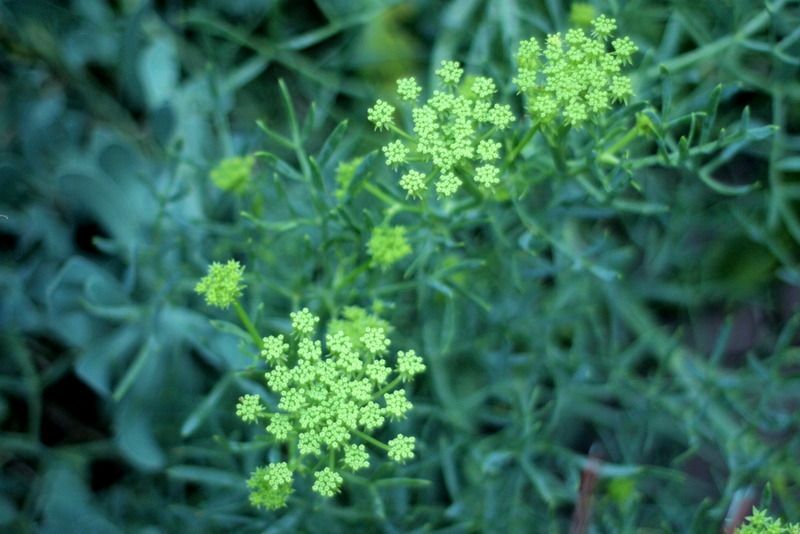 Umbels of Baltic parsley in the lower right. Cenolophium denudatum, the Baltic parsley, was started from seed a couple years ago. I think it would be happier in a wetter garden. Stays green and lush but not many flowers. Maybe I should try it in soups. I lifted and split the enormous clump of the grass Chloris virgata and started with smaller divisions last fall. It thickens up fast and does self-sow so no danger in losing it. Pot of cosmos in the background. Gomphrena ‘Fireworks’ and digiplexis. There’s some white cleome in here too I didn’t photograph. 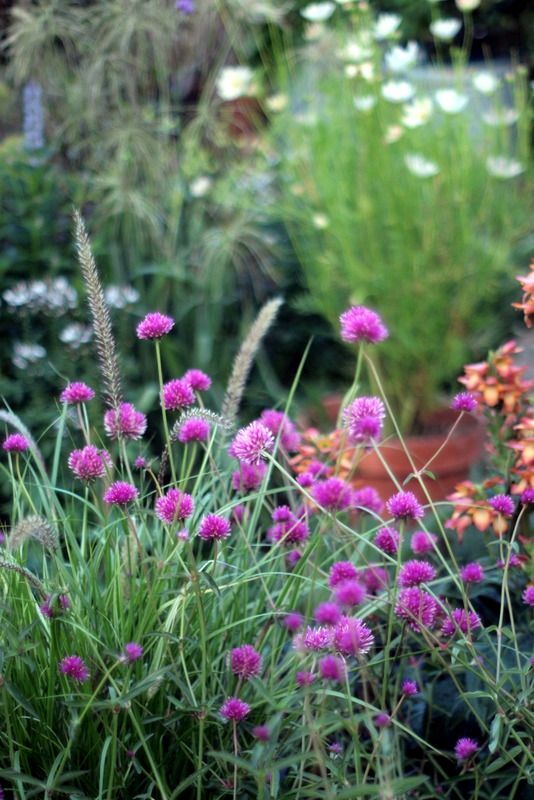 For animating a dry summer garden with just two kinds of plants, it’d be hard to beat this gomphrena with grasses. Purple orach on the left. 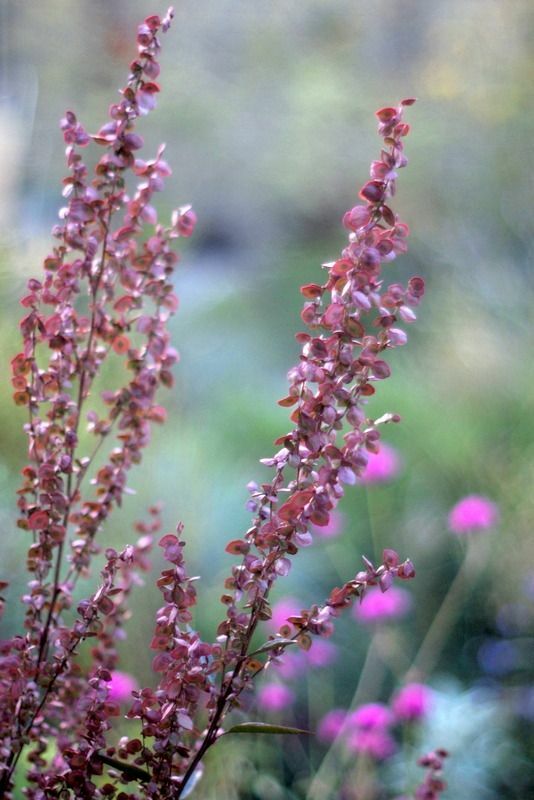 Seedheads of purple orach, Atriplex hortensis. Wish it did more than very lightly self-sow. The edible orach would no doubt be happier in the rich, moist soil of a vegetable garden. I once grew a fantastic chartreuse form too but couldn’t get it to reseed. The lower leaves are fed to the parakeets. The best umbellifer I’ve found for dry zone 10 is Crithmum maritimum. Dalea purpurea’s first year has been very impressive. 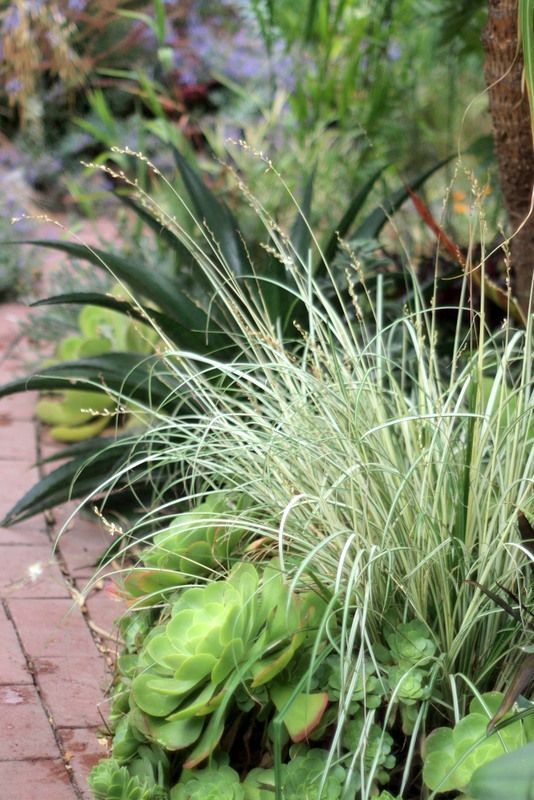 Tiny blooms on the grass-like Anthericum saundersiae ‘Variegata’ which thrives in the morning sun/afternoon shade in very dry soil under the tetrapanax with bromeliads and aeoniums. The kangaroo paws don’t seem as tall this year. Not long-lived anyway, the lack of winter rain may have contributed to smaller size. 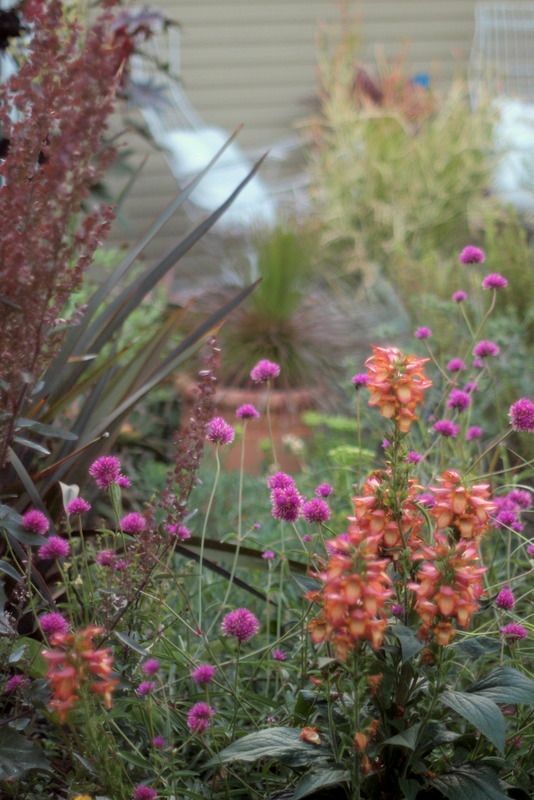 (‘Yellow Gem’) More fern-leaf lavender, with Gaillardia ‘Oranges & Lemons’ in the background. My garden is really too small for big clumps of rudbeckias, too dry for heleniums. 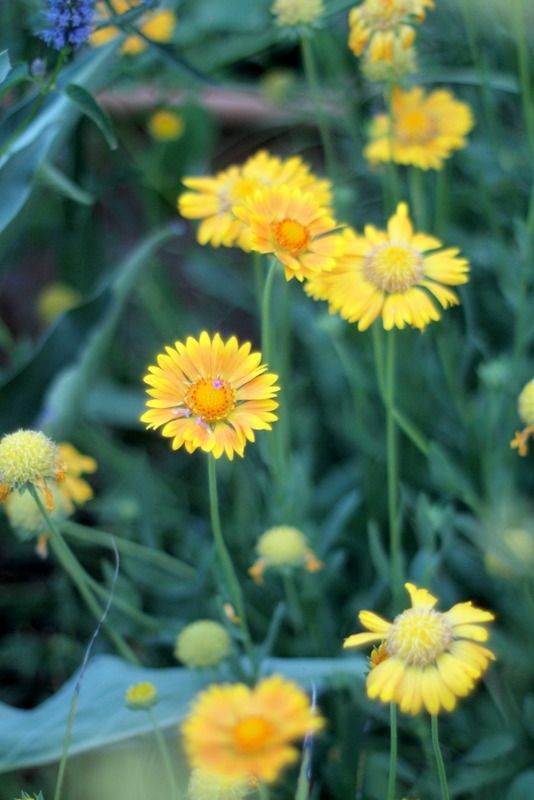 Gaillardias are just right. This one is sunshine on stems. 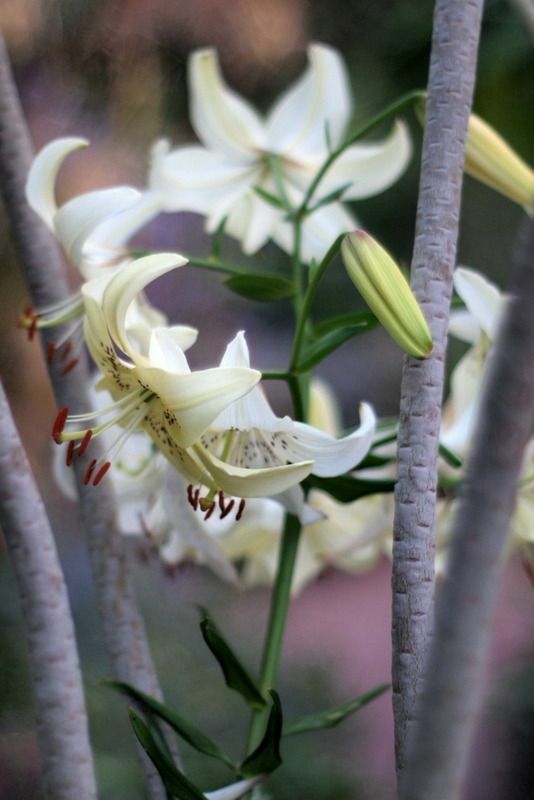 Out of three pots of lilies, only the white returned in spring, supported here by the trunk of Euphorbia lambii. 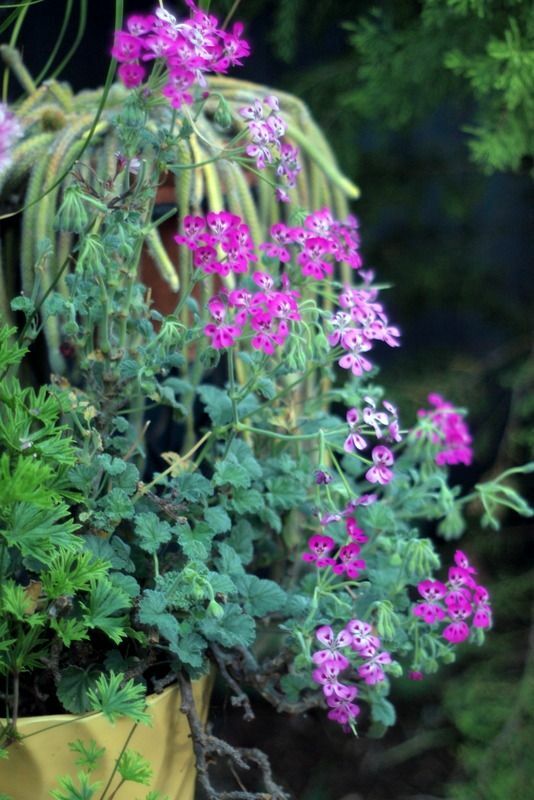 Pelargonium echinatum has started a new flush of bloom in the mild June weather. 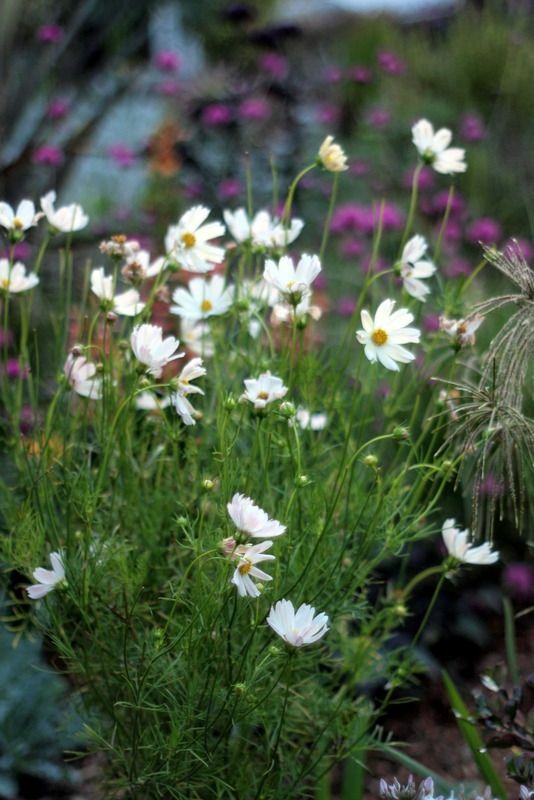 Catch up with other June gardens at May Dreams Gardens. 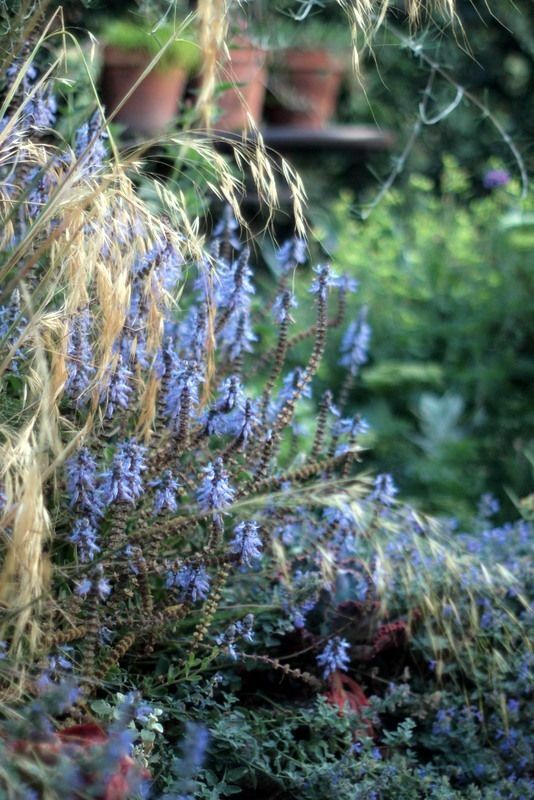 This entry was posted in Bloom Day and tagged Acacia baileyana 'Purpurea', Agastache 'Blue Blazes', Agastache 'Blue Fortune', Anigozanthos 'Yellow Gem', Anthericum saundersiae 'Variegata', Atriplex hortensis, Baltic parsley Cenolophium denudatum, Crithmum maritimum, Dalea purpurea, Gaillardia 'Oranges & Lemons', Gomphrena 'Fireworks', Lavandula multifida, Nepeta 'Walker's Low', nicotiana, Pelargonium echinatum, Plectranthus neochilus. Bookmark the permalink. Oh, Denise, I think this is one of your best posts ever. I don’t think it is counter-intuitive at all. Palms and bougainvilleas are tropicals. Everything fits together so well, the plants, the colors, the season, the location. I’d love to have most of these, especially the umbellifers, the agastaches and the plectranthus. Where did you find them? Seeds? Well done! Beautiful pictures! I especially like your blue corner. 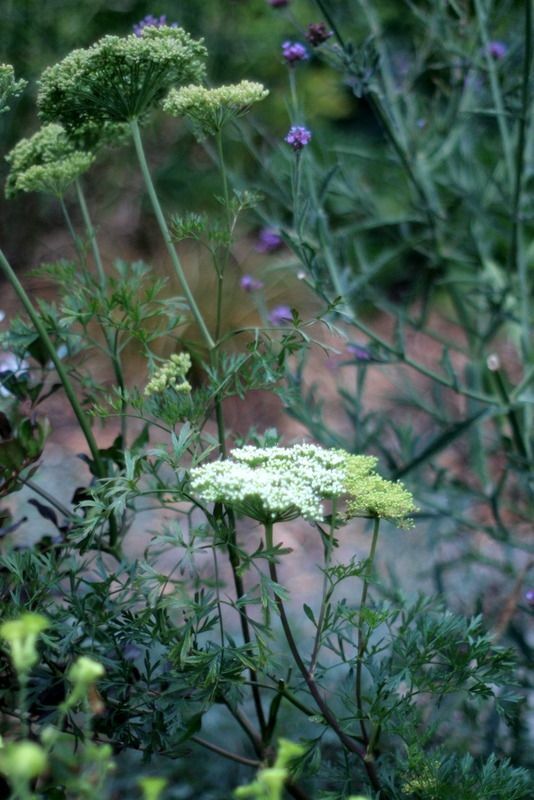 Hmmm…the name “cenolophium” keeps popping up in conversations and blogs…might be a good choice for me where I plan to swap-out the leaning centranthus ruber alba. I agree with Jane , l love and want them all . I do have the Orach , though it’s late in coming out this year . You have a lovely garden. I can see that from the colour in the background of most shots, as well as in the featured plants. Brick paths are something I really want to do here.. one day! @Jane, you made my morning! It’s not a very splashy summer garden but it keeps me interested. 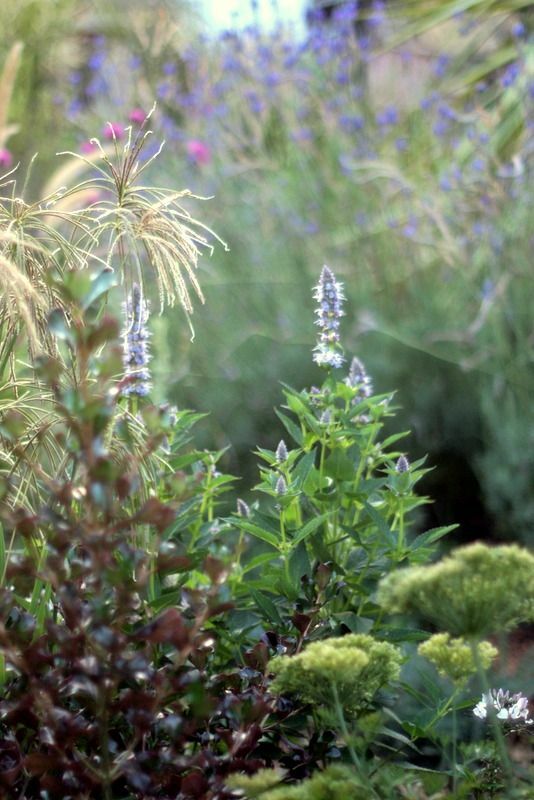 Some of the agastaches were bought local, some mail-ordered from High Country Gardens. Lots of the plants from seed come from Derry Watkins/Special Plants (http://www.specialplants.net/shop/seeds/) — amazing seed list and she will mail from her garden in England to the U.S. 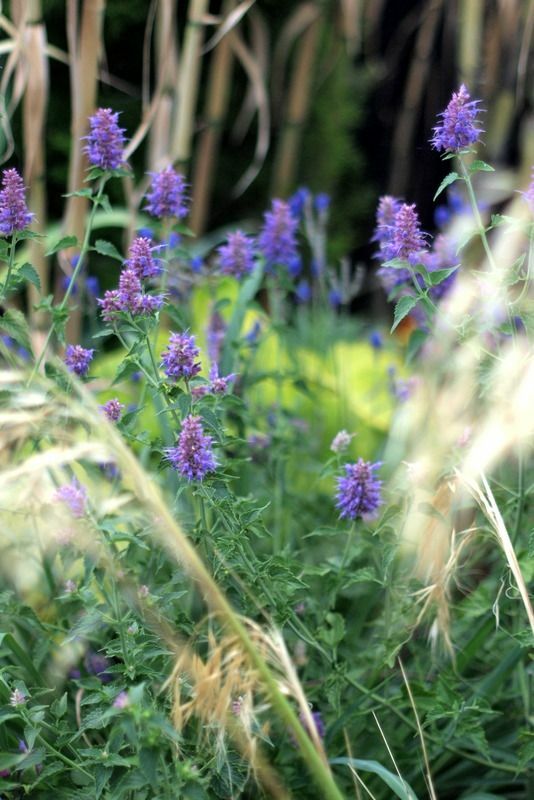 The plectranthus is from Annie’s Annuals. Nan Ondra at Hayefield is a great source of interesting seeds too. @Emily, I was surprised how blue the garden is this year. I don’t think anything is as easy as the centranthus. I had tons of volunteers from it only a couple years ago, but none turned up this year. @Linda, the orach rushes to seed fast here — wish I could get it to build up more of those beautiful leaves before it does. @RD, thank you for the kind words. I really need to get the bricks in better order, having changed directions so many times, old paths into new borders, etc. @Kris, I have been surprised how the agastaches need steady water to get established. I can’t remember where I found the crithmum. I’ve always wanted it but feared it wouldn’t grow here in SoCalif, then saw a huge established planting at the Huntington. Might have been from their sale. I’ve got a bit I’ll pot up for you. Gorgeous as always Denise! And your flowers are pretty too! Many of the photos have wonderful quality about them, almost nostalgic. Have you tried Pink Zazzle Gomphrena? It does not look at all like the other members of the family, and the flowers remind me more of something that should bloom on a cactus. Annie’s has the Crithmum, and I originally gave the Plectranthus neochilus to Annie many years ago, having first been introduced to it by Gary Hammer, who brought it back from his first trip to South Africa, pre-end of Apartheid days. Some quite lovely combinations, love the color of the Gomphrena. Doing your part to conserve water, but who can resist Bougainvillea in full bloom? I love some of the newer Agapanthus in extra deep blues/purples such as Elaine, Storm Clouf, inapertus, etc, all in full bloom here now. 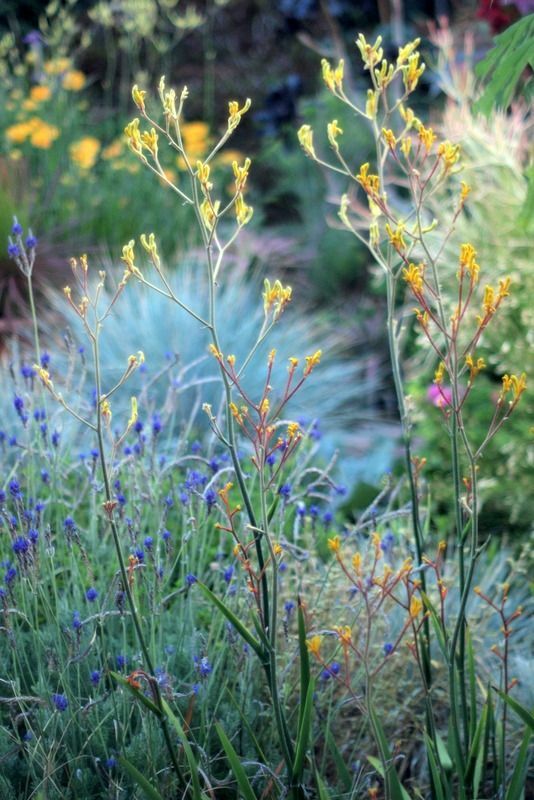 You might find it entertaining to add Plectranthus zuluensis, Neomarica caerulea and Dierama pulcherrimum to your mix, or Tweedia and Quesnelia seideliana for unworldly shades of blue. Ceratostigma willmottianum and C. griffithi are great for the blue theme too, and Moraea polystachya. @Peter, my garden easily slides into a garden without flowers even in summer. I’m making an effort this year. @Kathy, I’ve tried agastaches off and on for years, and I think the off years are due to the fact that they are damned difficult to make happy! I’m finding they want a lot more water in summer than I remember. @Scott, I keep thinking about your recommendation on getting a polarizing filter and mean to get around to it. For the meantime, I’ll stick with “magic” hour. @David, every comment is such a history/botany lesson. I visited a garden recently in the Hollywood Hills, where when asked what such and such was, the owner’s answer would always be “I don’t know. I got it from Gary Hammer.” It would be wonderful to collect anecdotes about him, he’s mentioned so frequently. And you’re right, I’ve got the drought and water shortages on my mind, and these plantings are part of this investigation. Dierama just never establishes here after multiple attempts. Just lost a promising start with reynoldsii. Tweedia does fine as does ceratostigma. I admire the bougs all over town – just don’t want to wrestle with them in my small garden. Storm Cloud is an amazing blue, I’ll give you that. I remember Hinkley speaking locally and asking the audience do we grow agapanthus, and everyone collectively rolled their eyes. Yet seeing his in bloom up at Windcliff, given rock star status, was like seeing them through new, unbiased eyes. Lovely gentle Bloom Day post, Denise. 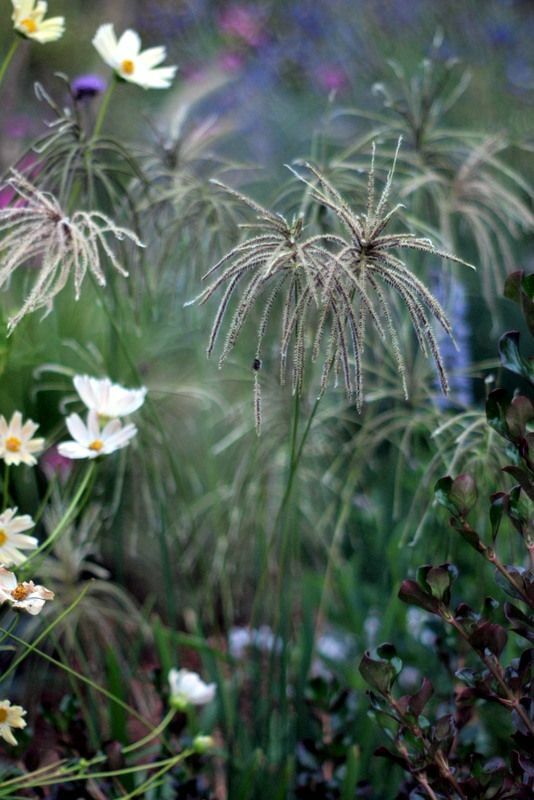 I love the look of those Chloris virgata seedheads. Must look that one up for the wet Northwest.